• Now available in a self-dispensing pack!. Forget using chalk or markers to plan your embroidery layout. You invest your time and talent creating beautiful embroidered projects. Don't risk damaging your fabric with pens or messy chalk. Target Stickers are the ideal solution to planning your embroidery layout. These removable, reusable stickers are not only clean and convenient; they will become an indispensable tool in your sewing studio. The stickers have a crosshair – making it easy to position your needle in the center of the crosshair. As long as the needle is centered in the crosshair you can be confident the embroidery design will be stitched in the position you planned. I have found these stickers to be very helpful, they are just tacky enough to stay in place, and can be reused several times. These are the best for keeping items marked for center. I am so glad I have purchased them. I love the target stickers, they help me keep my Embroidery where it needs to be. I love these. Use them all the time. Try them. great deal. perfect for machine emb alignment. These are wonderful. Just used them on a project and now I don't have to worry if I have my design in the right place. Thank you for your email informing me of them. 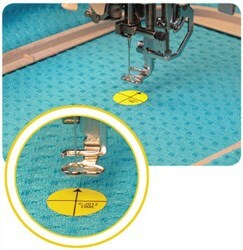 Target Stickers are the ideal solution to planning your embroidery layout. These removable, reusable stickers are not only clean and convenient!